Control: Three holding modules are available. All feature an easy-to-read digital thermometer, recessed control dials, a master on/off switch, and power indicator lights. Combination Module: At the flip of a switch change from heated holding mode to proofing mode. Individual analog controls for temperature and humidity levels. Holding Module: For heated holding applications. Analog temperature control and a passive humidity generation system. Proofing Module: For proofing applications only. Individual analog controls for temperature and humidity levels. Performance: All modules provide fast heat-up and recovery through a thermostatically controlled, forced air heating system. 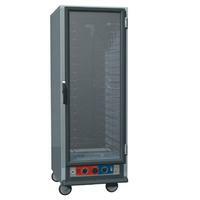 Doors: Clear polycarbonate doors provide visibility of the contents of the cabinet without the heat loss associated with opening the door. Capacity: Three slide styles provide maximum holding capacity. Universal: Adjustable wire slides, with SiteSelect™, hold 18"x26" sheet, 12"x20" steam table, 2/1 or 1/1 GN pans, and adjust on 1-1/2" increments. Lip Load: Fixed aluminum extrusions hold 18"x26" sheet pans on 1-1/2" increments. Fixed Wire: Fixed slides hold 18"x26" sheet, 12"x20" steam table, 2/1 GN, or 1/1 GN pans on 3" (76mm) increments. Combination Module: 2000 Watt, 120 Volts, 60 Hz., single phase, 16.7 Amps. 80°F to 190°F operating temperature range. 95% RH at 95°F. NEMA 5-20P plug. Holding Module: 2000 Watt, 120 Volts, 60 Hz., single phase, 16.7 Amps. 80°F to 190°F operating temperature range. NEMA 5-20P plug. Proofing Module: 1440 Watt, 120 Volts, 60 Hz., single phase, 12 Amps. 80°F to 120°F operating temperature range. 95% RH at 95°F. NEMA 5-15P plug.